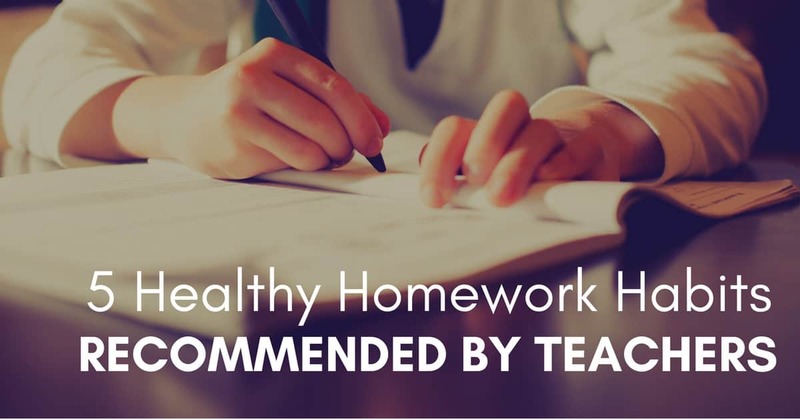 Teachers know that the best time to develop healthy homework habits for your family is before homework becomes a problem. Parents who approach their children’s homework without a clear strategy are asking for problems down the road when school gets hard. You see, students who haven’t developed effective homework habits tend to lack the motivation to study, misunderstand how to study, and fail to see the long-term benefits of putting forth an effort at home and at school. The good news is that it’s never too late to develop healthy homework habits; your family can start these five teacher-recommended steps at the start of a new school year, a new term, or even upon returning from winter or spring break. RELATED: Download Our Free Homework Charts! It’s true that sometimes life gets in the way of finishing every homework assignment on time. But when missing and incomplete homework becomes a regular occurrence, your child is missing out on the opportunity to get important feedback from his or her teacher before the class moves on to the next, more challenging learning activity. If your son never does his single-digit addition questions, his teacher won’t be able to help him prepare to add two-digit numbers together. The best way to stay on top of important due dates is to write them together on a family calendar in your kitchen or living room. Refer to the calendar together each day to see what needs to be finished soon, and to make a plan to get it finished on time. Different schools have different homework expectations. One major school board recommends five to fifteen minutes of reviewing schoolwork per day for students in grades one to three, up to thirty minutes per night of review and assignments for students in grades four to six, thirty to sixty minutes of homework per night for students in grades seven to nine, and two hours per night for students in grades ten to twelve. Work together as a family to schedule this work time into your afternoons and evenings, and to create a schedule that works around your children’s extra-curricular activities. Generally, if a student in grade nine is busy with dance or baseball on Wednesday night, it’s okay to skip homework that night as long as you then make two hours available on either Tuesday or Thursday. In the world of smartphones, tablets, laptop computers and social media, even the most well-intentioned young person can easily be distracted from their homework. Moving your child’s study space to a common area, like the kitchen table or a desk in the living room, can help you ensure that your child is using their time effectively. Make sure the homework space is equipped with everything your child needs, like pencils, erasers, pens, a calculator and a dictionary. Students should have one set of supplies for home and a second set for school… expecting them to carry a calculator to and from school each day is asking for a disaster on the day of their big math test! Periodically stop by your child as they’re working to see if they need any help with their homework and to ensure they’re on the right track. Homework is much more meaningful when students can see a connection between what they’re doing and their own lives. Look for opportunities to incorporate the topics that you see them exploring into your family’s daily life. If your daughter is learning fractions, hand her the pizza cutter! If your son is studying Spanish verbs, take him to an authentic Mexican restaurant and ask him to order in Spanish for the entire family! You can also talk to your children about the relationship between what they’re learning and what you do in your own job so that they can see concrete evidence of the value of their studies. Homework is important, but it isn’t everything. Don’t let the pursuit of academic excellence take away from your child’s other interests, like athletics, music, art or community service. Children and teenagers also need unstructured time with their friends in order to develop important social skills, and for older teenagers balancing homework with a part-time job can help them develop independence and financial management skills that will be essential in the future. Give your child the best start possible by finding a balance between homework and all of the other things that will allow them to grow into happy, healthy, well-rounded adults. While each of these five healthy homework habits is beneficial on its own, incorporating all five into your family’s routine is the best way to ensure that your children succeed at school and develop a lifelong love of learning.